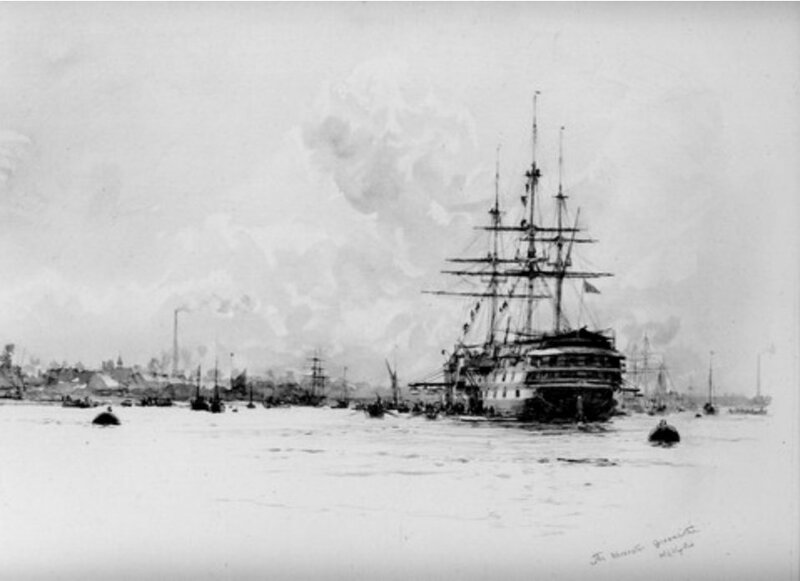 After school at Ovingdean Hall, Reggie joined the ‘Worcester’ – officially called the Incorporated Thames Nautical Training College, HMS Worcester (ITNC) and affectionately by the cadets as “the Ship”, which was a training academy for young officer cadets bound for the Royal Navy and the Merchant Navy. The training academy was situated on board the former warship named HMS Worcester, hence the name of the academy, which was moored on the River Thames at Greenhithe, just east of London, between Dartford and Gravesend. It was the second of three ships of that name to house the college so is often referred to as Worcester II in pictures of the vessel. 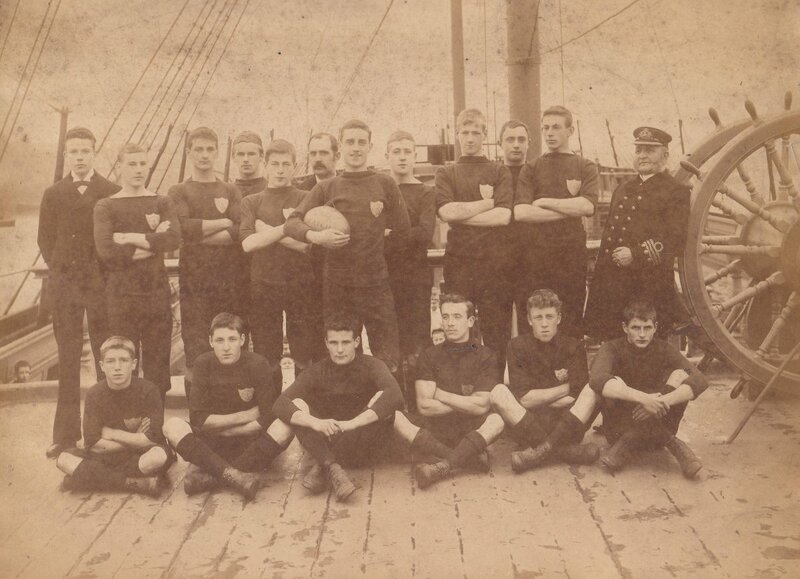 There are two photos of Reggie in the uniform of ‘Worcester’ but only one is dated – 1897. Reggie would have been fourteen at the time. 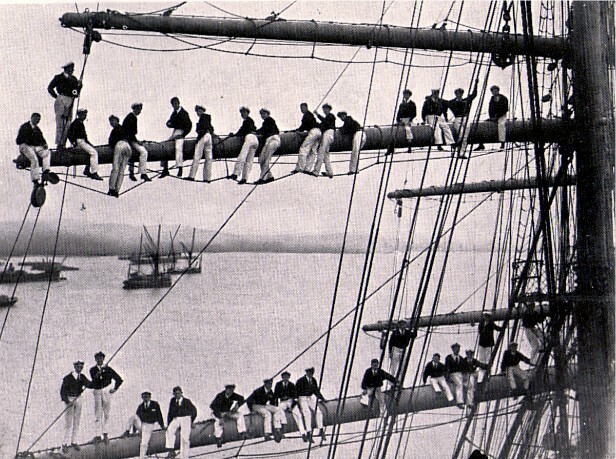 The academy had been founded in 1862 by a group of London shipowners, marine insurance underwriters and merchants who felt the need for pre-sea training for potential officers in the Royal Navy and Merchant Navy. The Admiralty provided the two decker, 1473 ton, 50 gun frigate HMS Worcester. 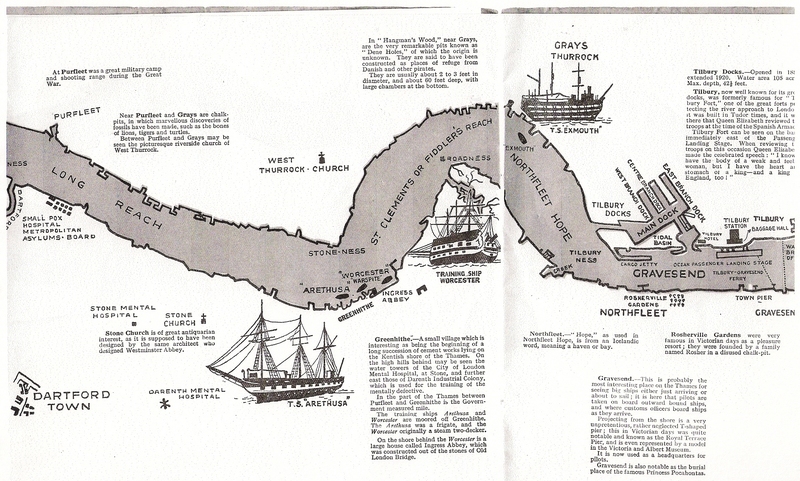 The ship was located at a number of places before being moored at Greenhithe were it remained but the school did not have any permanent shore facilities there until 1920 when the Ingress Abbey estate was purchased. ‘Worcester’ started with just 18 cadets but the numbers grew rapidly and there was soon a waiting list for entry. 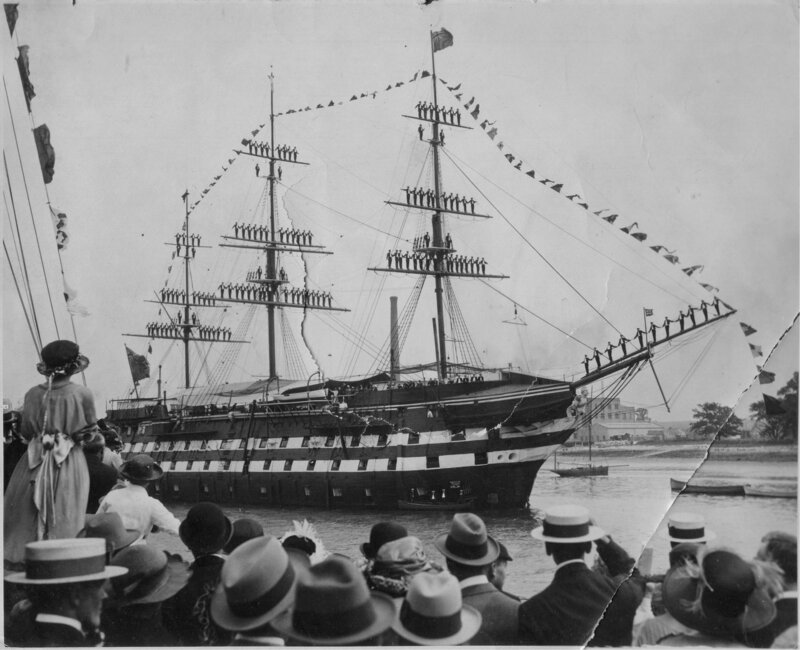 By the mid-1870s the first Worcester was too small and in 1877 ‘Worcester I’ was replaced by the much larger ‘Worcester II’ – the two decked battleship HMS Frederick William (4,725 tons, 214 feet long, 86 guns and screw propulsion) which was renamed the HMS Worcester on arrival at Greenhithe – and which could accommodate over 150 cadets. When Reggie was there in 1897 there were 155 cadets. 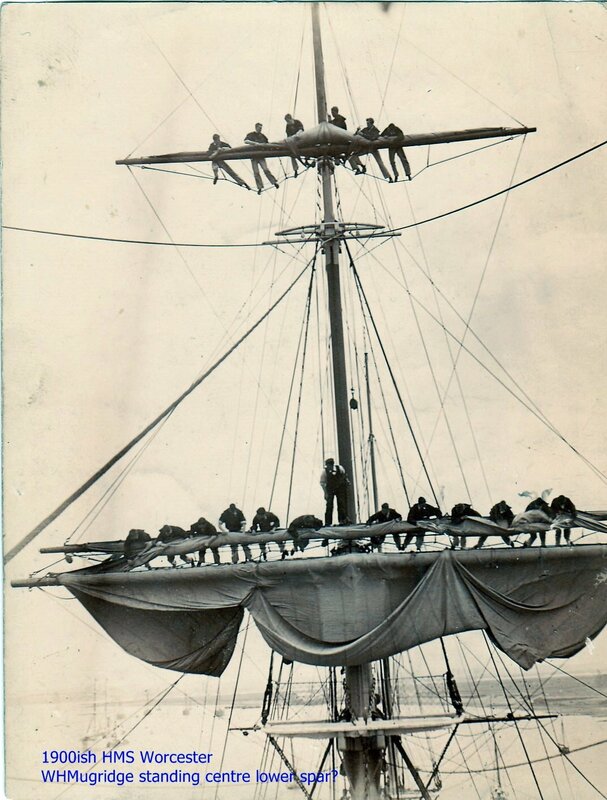 We give with this brief article a portrait group of the racing crew of the Worcester, which ship carried off the Challenge Cup on the Thames in 1892, and on the Mersey in 1893. 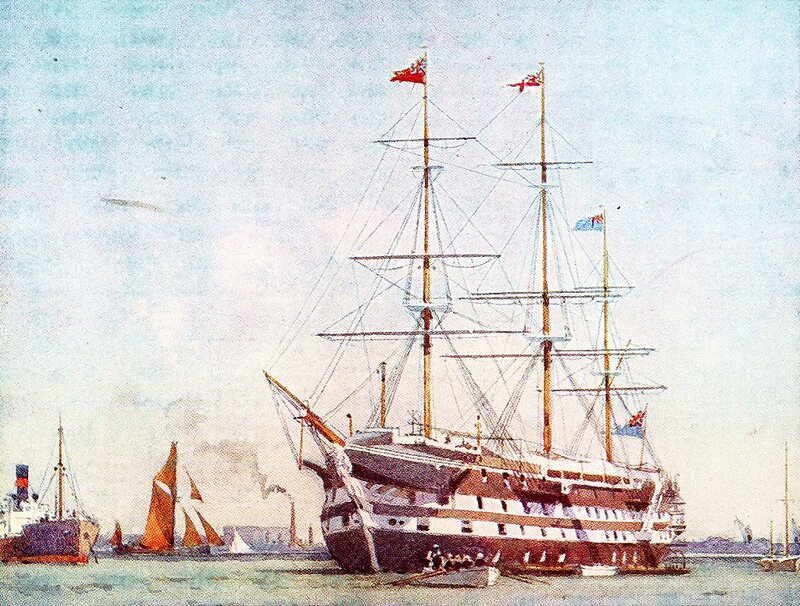 Captain D. Wilson, Barker, who started as a cadet on the Worcester, is now commander of this well-known training-ship, a few particulars about which can hardly fail to interest our readers. About five hours of the day, it seems, are devoted to schooling; the rest to technical training in all the practical duties of seamanship. The recreations and amusements of the boys have been carefully studied. 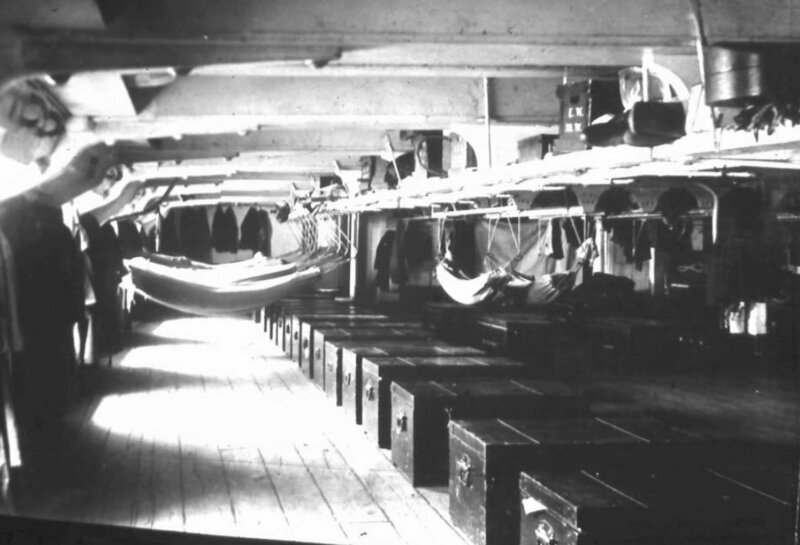 In the summer a swimming-bath is moored to the side of the ship, in which the boys are professionally taught. 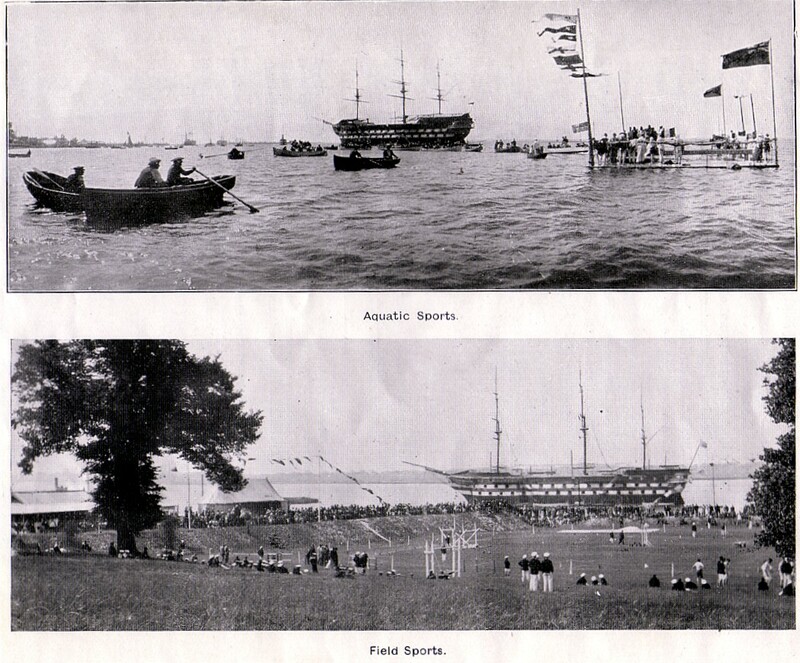 On the shore, at Greenhithe, a field of two and a-half acres has been secured for cricket, football, and tennis. To all these aids to muscle development must, of course, be added that of rowing, which is enjoyed ad libitum. The boys are generally received between the ages of eleven and sixteen, and remain from two to four years, according to their position in the school on joining. After a course of two years on board, a boy is entitled to a Board of Trade certificate, should he then be in one of the nautical classes; and a Worcester certificate is recognised by the Board of Trade as equivalent to one year’s service at sea. 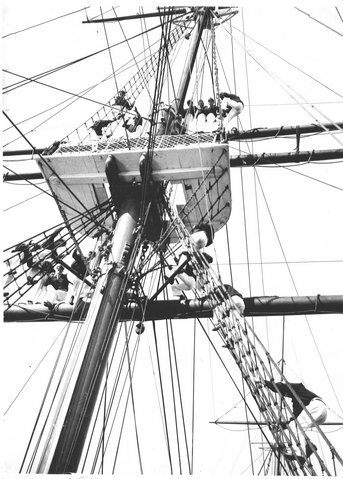 A great advantage that the cadets possess on leaving is the arrangement between the Secretary of State for India in Council and the committee of this training ship, whereby appointments as leadsmen apprentices in the Bengal pilot service are placed at the disposal of the latter. These appointments are very lucrative, the higher grades reaching £1,200 per annum. When accepted, a free passage to Calcutta is given to each cadet, and £20 towards an outfit. 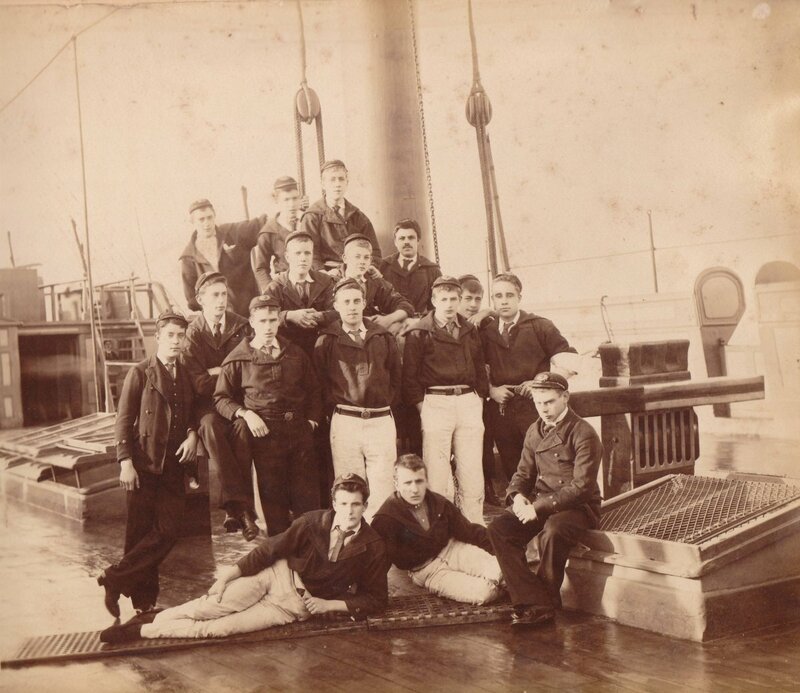 Considerable encouragement is given to Worcester boys to qualify for cadetships in the Navy. 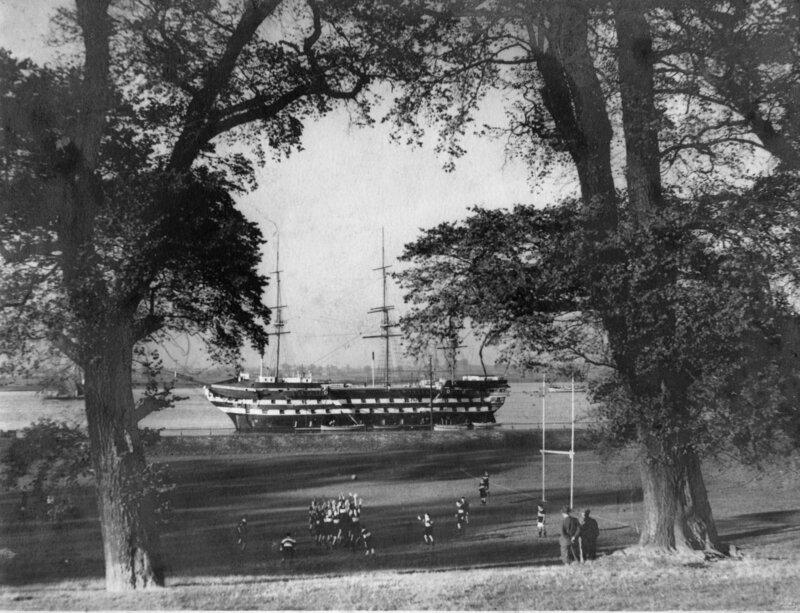 ‘Worcester’ was London’s answer to HMS Conway which was the first training ship for cadets and had been established on the River Mersey just two years previously in 1859 for Liverpool’s burgeoning merchant fleet. Throughout their history ‘Worcester’ and ‘Conway’ were fierce competitors, and the two met regularly on playing fields and in boats in keen sporting rivalry. In 1867 Queen Victoria instituted a Gold Medal presented annually to the best cadet. ” Her Majesty has also been pleased to grant for competition a gold medal. to be annually awarded to the boy who shows the qualities likely to make the finest sailor ; these consist of cheerful submission to superiors, self respect and independence of character, kindness and protection to the weak, readiness to forgive offence, and above all fearless devotion to duty .and unflinching truthfulness. 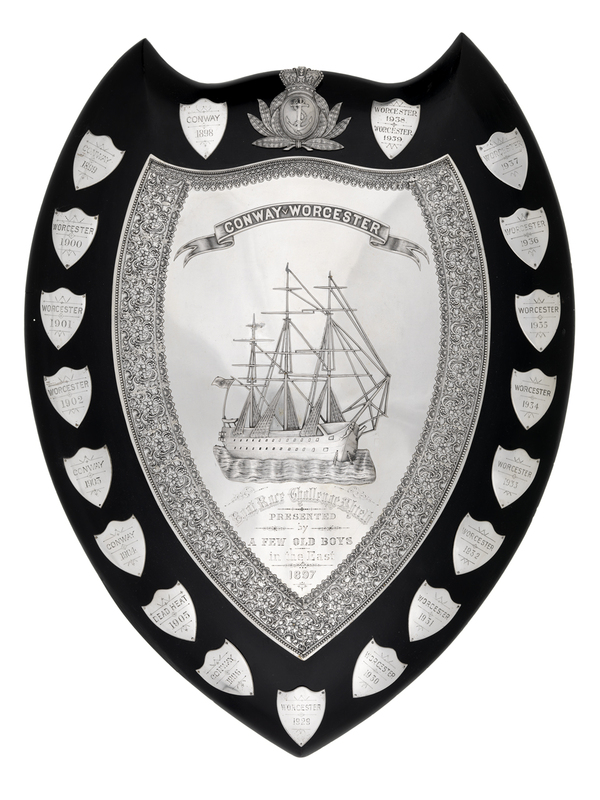 The medal will be open to boys who have been one year on board the ship, and have received not less than half the total marks at the previous quarterly examination. The commander, after conferring with the headmaster, shall select not less than three or more than five of the boys whom he considers to possess the qualities for which the prize is given. He shall submit these names to the boys who have been assembled for the purpose in the school, and each boy who has been on board six months previously to the time of distribution shall then and there vote for one of the boys so selected. The boy who obtains the highest number of votes shall receive the medal…..
“Although the Armistice was signed on the 11th day of the 11th month in 1918, the armed forces of Great Britain continued to fight in the Baltic, this time the Bolsheviks, the “wash up” after WWI, concerning honours and awards continued right up to 1921. In that period from 1914 to 1921, ex Worcester cadets were granted many gallantry awards, starting with two Victoria Crosses to Charles Henry Cowley, and Gordon Charles Steele, who many of us remember. Captain George Parker Bevan (1894) Albert Medal (AM), DSO, CMG. Our one and only Albert Medal (quite rare). It was for the action that Captain Bevan took to save the life of a Chief Officer trapped on a burning ship alongside the wharf at Murmansk, instituted by Queen Victoria’s consort Prince Albert for saving life at sea and not often awarded. There were 51 Distinguished Service Orders (DSO) and 52 Distinguished Service Crosses (DSC); 9 Distinguished Flying Crosses (DFC), 46 Military Crosses (MC); 3 Air Force Crosses (AFC); 5 Distinguished Service Medals (DSM); one Distinguished Conduct Medal (DCM) and 1 Military Medal (MM); the last three awards were for the other ranks, as well as 86 Mentioned in Despatches (MiD); and 87 Foreign awards, many of these were multiple awards to a single person. Eventually 5 of these OW’s were knighted, 3 Admirals, and two Air Chief Marshals, one of those twice! ; at the other end of the spectrum a LEUT Joseph Mair (1888) won a DSM as a sailor then a DSC as an officer. Two other DSM’s were awarded to LDGSMN William Albert Bennett (1866) at the age of 68, while serving on a minesweeping trawler, the other to LDGSMN Charles Henry Holmes (1866) also 68 and under similar circumstances. Flight Captain John William George Price (1915) DSC*, DFC* Croix de Guerre RFC deserves a mention for receiving two DSC’s and two DFC’s and the Order of Leopold, he was very active in flying over France and Belgium, being shot down on a number of times, on one occasion, landing in the Furness-Ypres canal, by the end of the war, the medical records showed he had had 32 bullets in his body over the war. There were a number of honours – as opposed to awards for gallantry – given to OW’s in the course of WWI. These were given to men whose efforts were away from the immediate battlefield or face to face action with the enemy. 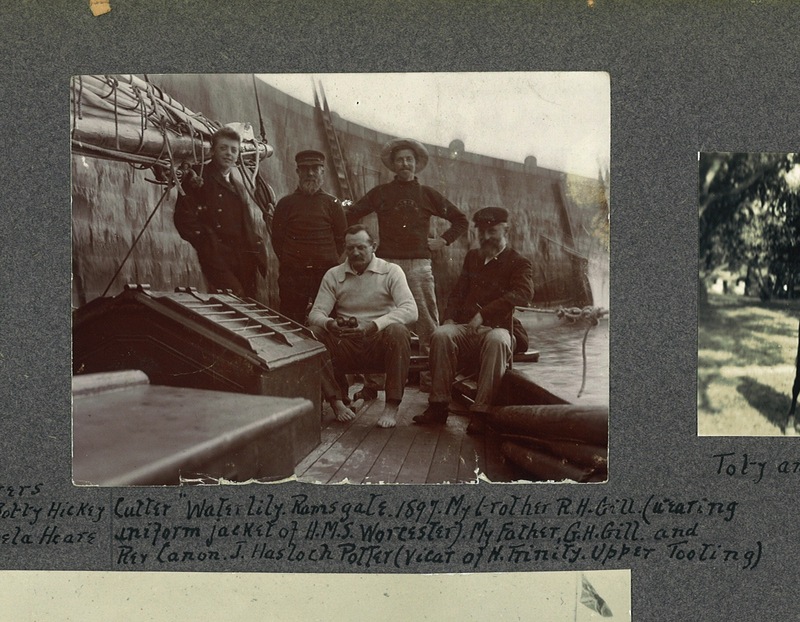 This entry was posted in RHG - early life and tagged HMS Worcester, Merchant Navy, sail training ship by gillww1. Bookmark the permalink. Fantastic news. Thank you for you getting on contact. I would love to see whatever details you have.I will send you an email separately.